Youtiao, also known as the Chinese cruller, Chinese oil stick, Chinese doughnut, You Char Kway/Cakwe/Kueh/Kuay (in Malaysia, Indonesia, and Singapore), and fried breadstick, is a long golden-brown deep-fried strip of dough eaten in China and (by a variety of other names) in other East and Southeast Asian cuisines. Conventionally, youtiao are lightly salted and made so they can be torn lengthwise in two. Youtiao are normally eaten at breakfast as an accompaniment for rice congee, soy milk or regular milk blended with sugar. Made with flour, vegetable oil, yeast, sugar, salt, and water (street vendors use Alum to make it crisper : baking soda, ammonium bicarbonate, alum). Sift dry ingredients together, mix in oil and water. Knead the dough, let it rest in a warm area (in a covered bowl) for 1 hour. Punch down, knead dough. Place in a dusted bowl, covered tightly with cling wrap overnight in refrigerator. The next day, take out the dough and let it rest on your countertop (or warm area) for 2 hours to come to room temperature. On floured board, roll dough to (4 inch x 1/2 inch x 24 inch). Cut the dough into 48 strips, (4 inch x 1/2 inch). Place 48 strips in 24 pairs, one on top of each other. Heat a wok with about 2 cups oil hot enough for deep frying. Lightly press a joined strip in the lengthwise center with a chopstick, making the impression only immediately before frying, then stretch to 8 inch. Gently lower into hot oil. Turn the strips and push them into the oil so they cook right through and brown evenly. Don’t fry too many at once as the temperature of the oil will drop, the dough will absorb more oil and become greasy. Fry until golden brown and puffy. Remove and drain on rack on paper. At breakfast, youtiao can be stuffed inside shāobǐng (Traditional Chinese: 燒餅, Simplified Chinese:烧饼; literally roasted flatbread) to make a sandwich known as shāobǐng yóutiáo (Traditional Chinese: 燒餅油條, Simplified Chinese： 烧饼油条). Youtiao wrapped in a rice noodle roll is known as zháliǎng. In Yunnan, a roasted riceflour pancake usually wrapped around a youtiao is known as shaoerkuai (Traditional Chinese: 燒餌塊, Simplified Chinese: 烧饵块). Yet another name for a sandwich variant is jianbingguǒzi (Traditional Chinese: 煎餅果子, Simplified Chinese: 煎饼果子; literally youtiao and fried bread). Youtiao are used to dip in to various soups, for example xidoufen. Youtiao is also an important ingredient of the food Cífàn tuán in Shanghai cuisine. Tánggāo (糖糕), or "sugar cake", is a sweet, fried food item similar in appearance to youtiao but shorter in length. In Thailand, youtiao or "pathongko" (ปาท่องโก๋) in Thai are eaten for breakfast with soymilk. The Cantonese name yàuhjagwái literally means "oil-fried devil" and, according to folklore, is an act of protest against Song Dynasty official Qin Hui, who is said to have orchestrated the plot to frame the general Yue Fei, an icon of patriotism in Chinese culture. It is said that the food, originally in the shape of two human-shaped pieces of dough but later evolved into two pieces joined in the middle, represents Qin Hui and his wife, both having a hand in collaborating with the enemy to bring about the great general's demise. Thus the youtiao is deep fried and eaten as if done to the traitorous couple. In keeping with the legend, youtiao are often made as two foot-long rolls of dough joined along the middle, with one roll representing the husband and the other the wife. In Indonesia, the fried dough is known as cakwe and is commonly chopped or thinly sliced and then eaten for breakfast. In Indonesia, the fried dough is known as cakwe (pronounced "chak-way"). It is commonly chopped or thinly sliced and then eaten for breakfast with bubur ayam (chicken porridge) or eaten as snacks with dipping of local version of chilli vinaigrette or peanut/sate sauce. In Laos, the youtiao is generally called pah thawng ko (cf. Thai patongkoh) and is commonly eaten with coffee at breakfast in place of a baguette (khao jii). It is also eaten as an accompaniment to chicken noodle soup. In Malaysia and Singapore, it is known in English as you char kway, you char kuey, or u char kway, transliterations of its local Hokkien (Minnan) name (油炸粿 iû-chiā-kóe). It is rendered in Malay as cakoi, an alteration of the Minnan term, "char kuey". The Malay version comes with various fillings, which are either sweet, such as red bean paste or savoury, such as sardines fried in tomato sauce. The plain version is usually eaten with coconut and egg jam kaya. Cakoi is usually sold in morning street markets or "pasar malam" night markets. It is also normally served with Bak kut teh (肉骨茶), porridge or rice congee, sliced thinly to be dipped into the broth/congee and eaten. It is also commonly eaten with coffee or soy milk for breakfast. The youtiao is a popular breakfast food in Myanmar, where it is called e kya kway. The youtiao is also a popular breakfast food in Myanmar (Burma) where it is called e kya kway. It is usually eaten with steamed yellow beans (with salt and oil). It is also usually dipped into coffee or tea. E kya kway is also eaten with rice porridge, or cut into small rings and used as a condiment for mohinga. Tea culture is very prevalent in Myanmar, and every shop will serve e kya kway for breakfast. Some shops stuff meat into the youtiao and deep fry it over again. It is called e kya kway asar thoot – stuffed e kya kway. 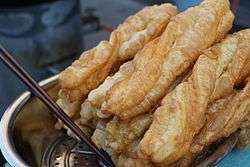 In the Philippines, the youtiao is called bicho (pl. bicho-bicho) although this name can also refer to sweetened, fried dough balls similar to the buñuelo, also called cascaron. In the Visayan region, they call it "sia-koy," usually twined like a rope. In Thailand, youtiao is generally called pathongko (Thai: ปาท่องโก๋, pronounced [paːtʰɔ̂ŋkǒː]) due to a confusion with a different kind of dessert. Pathongko is a loanword adapted from either Teochew Minnan beh teung guai (白糖粿; Mandarin: bái tángguǒ) or Cantonese of baahktònggòu (白糖糕; Mandarin: bái tánggāo). However, both possible original names are different desserts, not to be confused with the real white sugar sponge cake (白糖糕). It was previously sold together with youtiao by street vendors who normally walked around and shouted both names out loud. 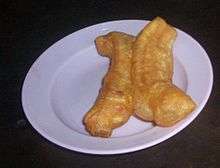 However, Thai customers often mistakenly thought that the more popular youtiao was "pathongko". Eventually, the real pathongko disappeared from the market because of its unpopularity. Ironically, the disappearance of real "pathongko" leaves youtiao being called under the former's name, but the latter's real name is generally unknown amongst the Thais. But the original white sugar sponge cake can still be easily found in Trang Province in Southern Thailand under its original name. Both Thailand and Cambodia are relatively neighbors to each other. So this is how they both have similar cuisines in ways. In Cambodia, it is used in rice porridge or noodle soups like Phnom Penh noodle soup kuy teav. This fried delicacy is dipped into the noodle soup. In Thailand, pathongko is also dipped into condensed milk or, in the South, eaten with kaya. In Vietnamese cuisine, it is known by a name that is a mix of Sino-Vietnamese and native Vietnamese to achieve a pronunciation similar to the Cantonese name, as dầu cháo quẩy, giò cháo quẩy or simply quẩy. 油 ("Dầu/giò") 鬼 ("quỷ/quẩy") coming from the approximate Chinese name. In Vietnam, giò cháo quẩy is eaten typically with congee, pho in Hanoi and sometimes with wonton noodle (mi hoanh thanh). In Australia it is sometimes called chopstick cake by some Cambodian Chinese immigrants because of its resemblance to a pair of chopsticks. In Cambodia, it is called Cha Kway, which is similar to Indonesia, Malaysia, and Singapore. Cha Kway can be eaten with along with porridge, Chinese noodles, noodles, coffee, or condensed milk. ↑ Similarly, the dish known as chhá-koé-tiâu (炒粿條) in Minnan, kóe-tiâu being the Minnan name for flat rice noodles (literally "(rice) cake strips"), is on Cantonese menus rendered as 炒貴刁 (ja gwaidìu) where the characters 貴刁 (gwaidìu, literally expensive (Surname)) are equally meaningless. See Char koay teow: Etymology for more information. ↑ "Chinese Breakfast" at About.com. Accessed 1 May 2008. ↑ West Lake, a Collection of Folktales (ISBN 9620400542) page 181. ↑ "Laos: Food and Drink." Archived June 16, 2008, at the Wayback Machine. at CPAMedia. Accessed 30 May 2008. Wikimedia Commons has media related to Youtiao and You tiao. Spices, seasonings and flavourings etc.